Breeding Ball Pythons? Boa constrictors? We have an outstanding high-res black and white ultrasound for your snake breeding program! We are very excited to be working with the snake-breeding community. We've been working with numerous breeders (from large operations to small enthusiasts) for a year now. And we've come to a few conclusions - not the least of which being that this is a lot more fun than selling an ultrasound to scan someone's bladder! For our NEW page on ball python ultrasound . . . click here! We are also very committed to actively supporting the python and boa breeding community by making this niche of our product line into one of our most thriving applications. The value of bringing an ultrasound to your breding program, even over the span of a few breeding cycles (much less the cumulative compounding effect over the course of a few years) is truly immeasureable. We anticipate that by 2010 every serious snake breeder around the world will be using an ultrasound for selecting females for optimal breeding results. And we want to be at the forefront of making that possible. An ultrasound program will enable you to monitor the follicle length in your females and dramatically improve your percentages and your success rate at breeding your prize specimens. One or two improved breeding cycles will easily more than pay for your entire investment in acquiring an ultrasound. Without question, you are going to want either the CTS-3300 or the CTS-5500 portable broadband system, equipped with either the linear 5.0/7.5/10.0 MHz transducer or (as some prefer) the side-firing linear 5.0/7.5/10.0 MHz urological probe. We have offered lesser systems in the past, and invariably our clients have upgraded to the at least the CTS-485 (predecessor of the new CTS-3300) — and been thrilled. We want thrilled clients. We want you to have a fabulous time working with your ultrasound and get the very best results. The CTS-3300 and CTS-5500 systems make that possible. And to make it even better, the snake-breeding package we offer is heavily discounted right now as we build our clientelle of active breeders. You will likely use a shallow water bath to assist in calming the snake and maintaining a consistent contact during the procedure. An average scan with the CTS-3300, including the time to make an accurate measurement, will take you no more than two minutes, and possibly less than a minute. You can record the results and move on, or you can print out an annotated image, or save an image internally on the ultrasound itself, or even save images to a USB thumb drive to transfer to your computer. 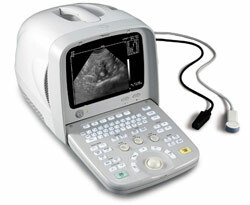 You can actually even record an entire ultrasound procedure to your computer or onto a VCR if you like. For more information on our snake-breeding package deals, including our exclusive training program (where we fly an expert from our staff to work with you in your facility, on your snakes, and ensure that you are implementing ultrasound in your breeding program with the greatest effectiveness), you may submit our inquiry form and we will be in touch with you soon, generally within an hour. If instead you would like to talk with us right away, please call us at 800-839-0722. We look forward to hearing from you and helping you revolutionize your ball python breeding program!